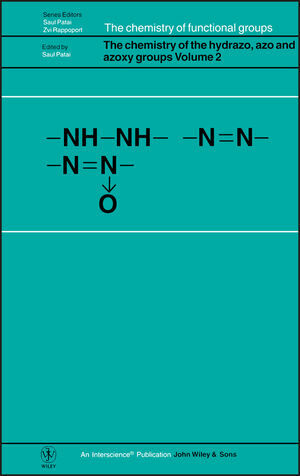 The first volume of The Chemistry of the Hydrazo, Azo and Azoxy Groups was published in 1975 in two parts, and the present book is the second volume of this publication. Since 1975 three supplementary volumes dealing with the chemistry of double-bonded functional groups were also published in the Series and these volumes contain much material on the chemistry of azoxy compounds. Several subjects were omitted from the original volume in 1975. These omissions have been corrected in the present volume, which contains chapters on "Detection, identification and determination," on NMR, on ESR, on PES, on pharmacology and toxicology, and also on safety and environmental factors. Electronic Structure of Hydrazo, Azo and Azoxy Compounds (H. Basch & T. Hoz). Mass Spectra of Hydrazo, Azo and Azoxy Compounds (T.-W.
NMR Spectroscopy of Azo, Azoxy and Hydrazo Compounds (J. Mason). Acidity, Basicity and Complex Formation (T. Klapötke). Electronic Effects of Hydrazo, Azo and Azoxy Groups (J. Shorter). The Photochemistry of the Hydrazo, Azo and Azoxy Groups (W. Horspool). Radiation Chemistry of Azo and Hydrazo Compounds (Z. Alfassi). Radical Reactions of Azo, Hydrazo and Azoxy Compounds (G. Koga, et al.). Biological Formation and Reactions of Hydrazo, Azo and Azoxy Groups (D. Banthorpe). Safety and Environmental Effects of Azo Compounds (V. Glezer).